“What’s the deal with those flaming puppets?” you may well ask. How convenient! A current example of just the sort of thing we learned about in today's tidbit. 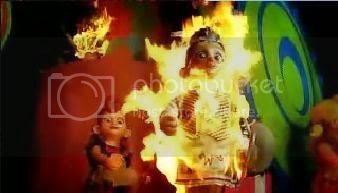 It IS frustrating to speculate about why the flaming puppets couldn't appear in the trailer, given that they appear in the movie. But, ours is not to reason why (or to reason at all), ours is just to be good little kiddies and let ourselves be "protected" from all the badness (real or imagined) in the world. Oops, sorry - I'll not go there. Bix wrote: How convenient! A current example of just the sort of thing we learned about in today's tidbit. It IS frustrating to speculate about why the flaming puppets couldn't appear in the trailer, given that they appear in the movie. But, ours is not to reason why (or to reason at all), ours is just to be good little kiddies and let ourselves be "protected" from all the badness (real or imagined) in the world. Oops, sorry - I'll not go there. Oh, go ahead Bix, go there go there! I'm right behind ya! I can't even imagine what their reasons were! Thanks, KYwoman. I knew I sensed kindred spirits here at the Zone! Maybe someone from Disney is on the MPAA review board....hmmm? Then one would think WB might want to leave it in? Maybe they thought it was a little much for the kiddies? Who knows. Like Bix said, we will just sit back and be taken care of...or not.